Suspect Sought in Shooting on Rideau St. 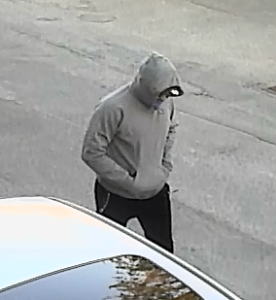 The Ottawa Police Service Criminal Investigations Unit and Crime Stoppers are seeking the public’s assistance in identifying a suspect involved in a shooting. On the 23rd of December 2018, at approximately 10:20 pm, a shooting occurred outside the 90 block of Rideau St. The suspect fled the area. The suspect is described as a male, wearing a blue hooded jacket, grey pants and blue shoes. Please see picture below provided by investigators. If you know the identity of the individual call the Ottawa Police Service Central Criminal Investigations Unit (613) 236-1222 Ext 5166 or Crime Stoppers toll-free at 1-800-222-8477 (TIPS). Remember Crime Stoppers does not subscribe to call display, we will not ask your name or record your call and you are not required to testify in court. If your information leads to their identity, you could qualify for a cash reward of up to $2000. You can follow us on Facebook, YouTube and Twitter. 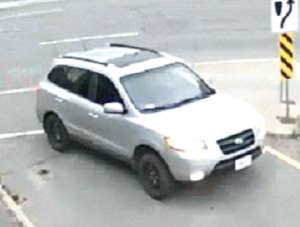 The Ottawa Police Service and Crime Stoppers are seeking the public’s assistance for any information regarding a vehicle implicated in a crime. The police are looking for any information on a suspect vehicle involved in a shooting in the 1000 block of Merivale Rd on the 6th of October 2018. 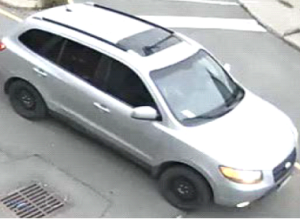 Suspect vehicle described as a silver Hyundai SUV, 4 door, tinted windows, sun roof, black winter type rims. Please see photos below provided by investigators. If you have any information about this vehicle or the owners/drivers, please call the Ottawa Police Service Central Criminal Investigations Unit (613) 236-122 Ext 5632. Anonymous tips can be submitted by calling Crime Stoppers toll-free at 1-800-222-8477. Remember Crime Stoppers does not subscribe to call display, we will not ask your name or record your call and you are not required to testify in court. If your information leads to their identities you could qualify for a cash reward of $2000. You can follow us on Facebook, YouTube and Twitter. (Ottawa)— The Ottawa Police Service is asking for assistance in identifying a male suspect in a shooting incident that occurred in the 2400 block of Bank Street, near the intersection of Hunt Club Rd in Ottawa on June 9, 2018. The incident happened at about 8:20 pm, when a male entered a business and fired several shots. No one was injured as a result. 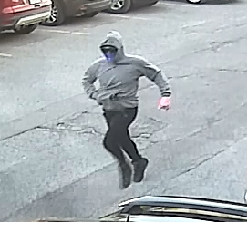 The suspect is described as 6’01” (185 cm), wearing a dark-coloured hooded sweatshirt, black pants and shoes, sunglasses, and a bandana covering his face (see photo). If you have information that could assist investigators, please contact the East Criminal Investigation Unit at 613-236-1222, ext. 3566. Anonymous tips can be submitted by calling Crime Stoppers, toll-free at 1-800-222-8477 (TIPS) or by downloading the Ottawa Police app. 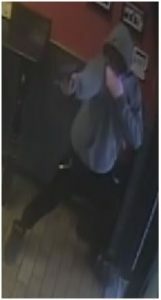 In the early morning of June 26, 2017 a 25 year old male was involved in a fight with a group of unknown people in front of an establishment located in the 400 block of Rideau Street, Ottawa. During the fight the victim was shot once by one of the members of the group that he was fighting with and he died of his injuries. There were a number of people present prior, during and after the fight had occurred. Investigators from the Major Crime Unit with the Ottawa Police Service are seeking anyone who was at the bar and, or witnessed the altercation. If you were in the vicinity, or know of somebody who was, contact the Ottawa Police Service’s Major Crime Unit at 613-236-1222 ext 5493 or Crime Stoppers toll-free at 1-800-222-8477. Photographs and videos can also be sent to Crime Stoppers through the Crime Stoppers web page.